Daedalic Entertainment has established themselves as a respectable developer of point and click adventure games. Their most recent game in the genre is Memoria, the sequel to Chains of Satinav, which was released in Europe in 2011. Although Memoria is based on the events of Chains of Satinav, it can be enjoyed by someone (like me) who has not played the first game in the series. Both games take place in a fantasy universe based on a pen and paper role playing game that is popular in Europe called The Dark Eye. Once again Daedalic Entertainment succeeds in creating an enjoyable point and click adventure, complete with beautiful visuals and an interesting storyline. 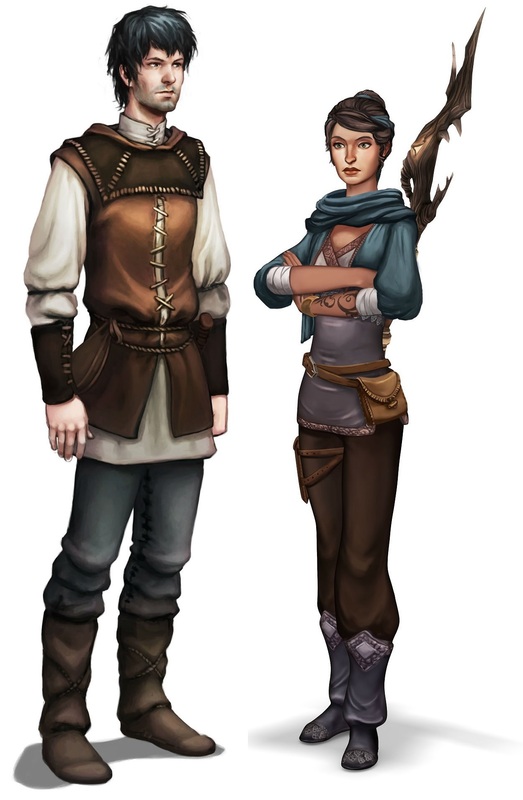 In Memoria the player controls a man named Geron, who is desperately searching for a way to lift a curse that turned his friend Nuri into a raven, and Sadja, a princess from a faraway kingdom called Fasar who lived in the distant past. As Geron journeys to lift the curse, he meets a stranger who promises to cure Nuri, but only if Geron can solve a certain riddle. In order to do that Geron has to learn everything there is to know about Sadja, the princess who in the distant past was determined to become a famous hero. 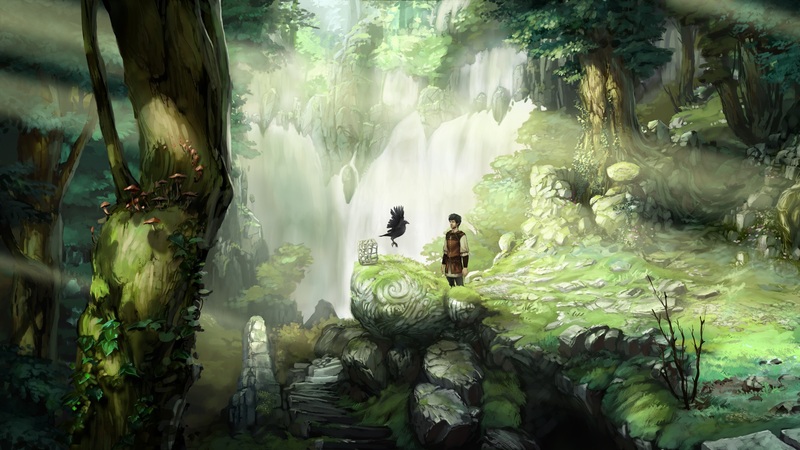 Throughout much of the game, the story unfolds slowly and deliberately. Both Geron and Sadja encounter a seemingly endless succession of obstacles as they travel, and each of those becomes a puzzle for the player to solve. Step by step the intricacies of the plot come into focus, and there is a surprising amount of character development for not only Geron and Sadja, but for several members of the supporting cast as well. To reveal my favorite of those would be a bit of a spoiler, but suffice it to say that Sadja rarely travels alone and has one particularly interesting companion. As the game progresses, the stories of Geron and Sadja begin to weave together. When the final secrets are revealed, there is a decent emotional payoff waiting for the player. It’s not a perfect storyline, but it gets the job done and provides enough reason to keep playing through the game, even when the puzzles start to feel tedious or the solutions become a bit too obscure. Like in most point and click adventures, solving puzzles in Memoria involves picking up potentially useful objects and using them to manipulate characters, the environment or other items in the player’s inventory. Memoria spices things up by including a few magical spells as well, such as one that can destroy or repair objects, or another that can turn living things into stone or restore them to life. The solutions to the puzzles can be as simple as pointing a key at a lock, or as complicated as combining a group of unlikely items into a makeshift bridge. If you’re anything like me, you will eventually stumble upon a puzzle (or puzzles) that stump you completely. In my case I failed to realize that certain items could be combined in my inventory, and on one occasion, I couldn’t figure out how to advance further for a half hour or so before finally discovering an embarrassingly obvious solution. Fortunately Memoria includes a couple of mechanics to help a stuck player. The menu screen contains a very brief description of your next objective that can be expanded into a slightly more detailed hint. I say slightly because there are times when these hints are either too vague or completely useless. Twice in my playthrough I had to consult a source of information outside the game itself in order to continue. Maybe I’m just bad at point and click adventures, but I’d still like to see some kind of last resort hint system that literally says, “Combine this with that,” or, “You forgot to pick up that,” in order to get me moving again when I’m stuck. On the other hand, pixel hunting (searching every spot of a map) for usable objects is not an issue at all in Memoria, because you can hold down a button that makes it obvious where all of those objects are. And even if such a system were not in place, the beautiful and clear visuals do a fine enough job of grabbing the player’s attention when necessary. If there’s one thing Daedalic Entertainment always does right, it’s the visual presentation in their games. Memoria is no exception; every screen is a work of art. The backgrounds are displayed beautifully in high definition, and are filled with details both subtle and extravagant. There is animation everywhere, from pigs moving about in squalor (or roasting on a spit) to burning flames and rolling fog. The characters themselves are also animated with loving detail. If I wanted to be picky, I could complain about how changing the direction the main character is facing results in an unanimated and instantaneous turn or how sometimes the characters feel as though they are animated in slow motion. But really, those are minor blemishes on an otherwise fantastic looking game. The audio in Memoria is more of a mixed bag. I played the game with English voiceovers, and a couple of the characters have absolutely incredible voices. But for every great voice, there are two or three that are much less inspired. It doesn’t help that the game bases the flow of its dialogue on individual lines as they appear as text. Sometimes the beginning of one sentence will follow too closely after the end of another, or too far apart. In either case, it makes the pacing of the dialogue sound unnatural. Sudden changes in volume (likely the result of multiple takes in the recording studio) provide further distraction from otherwise enjoyable moments of the storyline. Fortunately, the rest of the aural presentation is solid. Although there aren’t any particularly memorable or standout tracks, the music blends appropriately with the atmosphere of the game, and does a great job of increasing immersion throughout Memoria. Similarly, I barely took notice of the sound effects because they existed so naturally within the game world. Sadly, there were a couple of bugs in the version of the game I played that jolted me out of the experience. I was quite surprised when one character spoke a couple of lines in a different language before nonchalantly continuing his dialogue in English. I also managed to get a character to teleport back and forth between two locations (having absolutely nothing to do with magic). The worst was a potential game breaker though; a character I needed to talk to broke completely, and would not respond to my clicks. As this character was essential to continue the game, I had no choice but to load an earlier save file. The good news is Daedalic Entertainment has fixed this particular bug for the version of the game that will be available on launch day, and they assure me that the other bugs have been fixed as well. Hopefully the game will be bug free by the time you play it. As a whole, Memoria is another solid offering from Daedalic Entertainment. If you don’t like point and click adventure games, there isn’t anything here that will win you over. But fans of the genre will surely enjoy solving puzzles and unraveling the many mysteries of the storyline. With its interesting characters, beautiful visuals and challenging puzzles, Memoria is worth remembering. Ari completed Memoria in 13 hours. He received a copy of the game from Daedalic Entertainment for review purposes.